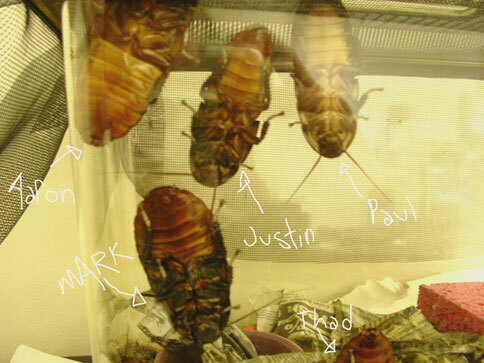 Paul, the least ethically suspect of that bunch, sent us this photograph of their new office mates. This was not our present; we got them three tickets to "Whale Rider". These fellows on the right crawled out of Marky's beard. We'll be part of the Hydra Head/Tarantulas showcase at South by Southwest on March 17th. Visit the 'Shows' page for more detail. Oh, and [this] is really funny. Cute Photoshop embellishments by Paul. Rumor has it that these things reek of the smell of death. Thank God they're 3500 miles away from us. NEWS ARCHIVES .